Happy Thanksgiving from Kunming, China! Two years ago in Dalian, I celebrated Thanksgiving at a fancy hotel buffet where I ate turkey, tacos, and some smoked salmon (for good measure). 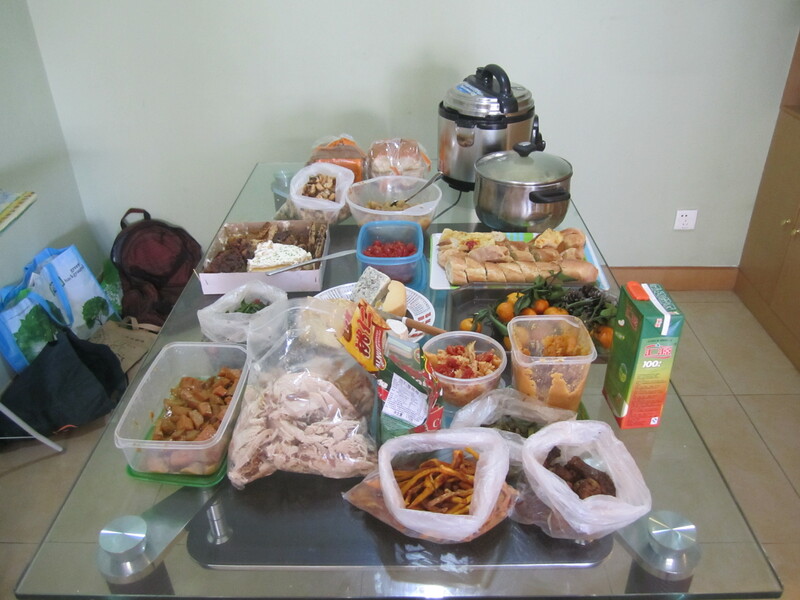 Last year in Kunming, I went to a potluck with too many people and not enough food. So this year, I decided that I was due to host my very own Thanksgiving and do it right! In the end, we had 17 people in our tiny living room, but it ended out working pretty well. I drafted up a dream menu and assigned people things to bring, and we had a wonderful spread of all the Thanksgiving favorites… and then some! I had some kitchen helpers to prep before the big dinner, and we had every cooking appliance in use: the microwave, the single burner, the oven, the electric hot plate, and a pressure cooker, too! Everyone really pulled their own weight and it was amazing to see all of the food come together. The turkey was a pricey little bugger, but worth it! I froze some leftover turkey soup to get out again in a few weeks. The spread! We had turkey, mashed potatoes, gravy, cranberry sauce, three different kinds of sweet potatoes, green beans, pasta with roasted veggies, stuffing, spinach salad with nuts and blue cheese, beef stew, chicken wings, foccacia bread… and I’m probably forgetting some things! The desserts stole the show, in my opinion. Good thing I managed to save some room for lemon cheesecake, pumpkin pie, chocolate chip cookies, peanut butter rice crispie treats with chocolate icing, apple sauce and chocolate kisses. 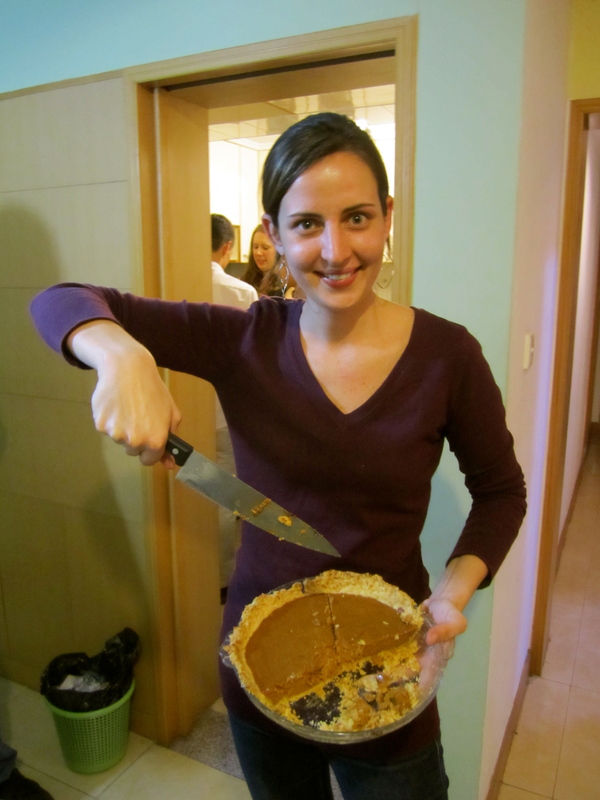 I made the pumpkin pie and crust from scratch, and it turned out perfect! I’ll be making that recipe again soon. People slowly started to leave around 11, after all, most people had to work again on Friday. A few of us sat around and talking and laughing, while complaining about our full stomachs. 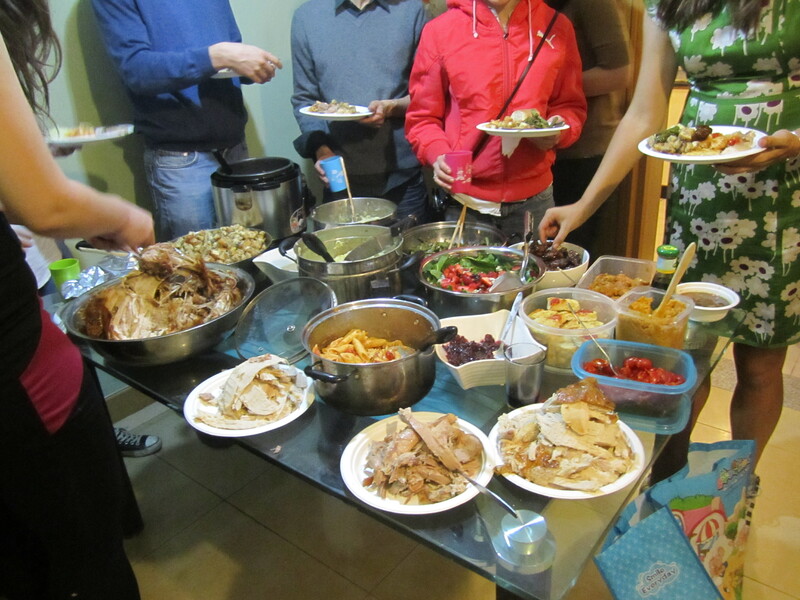 The next day I had a bunch of people over AGAIN to help me put a dent in the leftovers. Even with people taking home doggie bags, and eating lunch, I still have tons of leftovers that I’m slowly trying to work my way through. 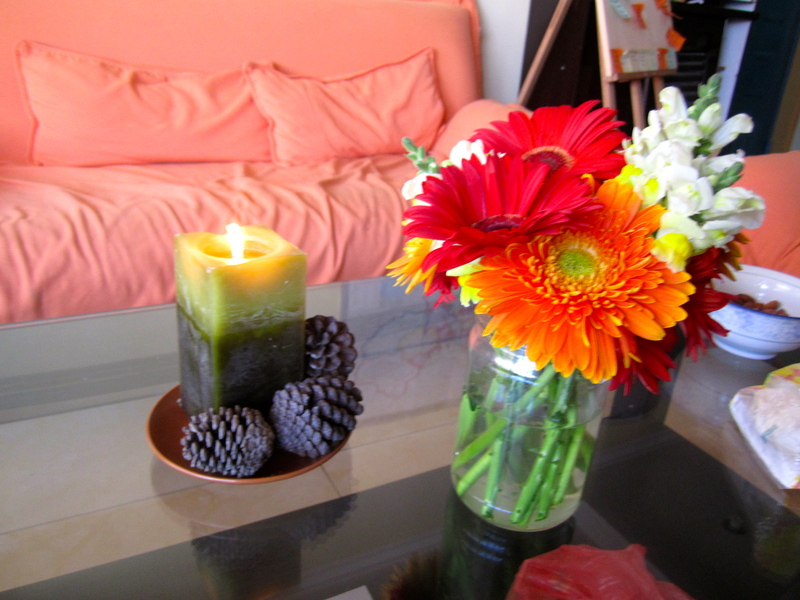 Little centerpieces I made. I think they turned out pretty well! Overall, a great time was had by all. 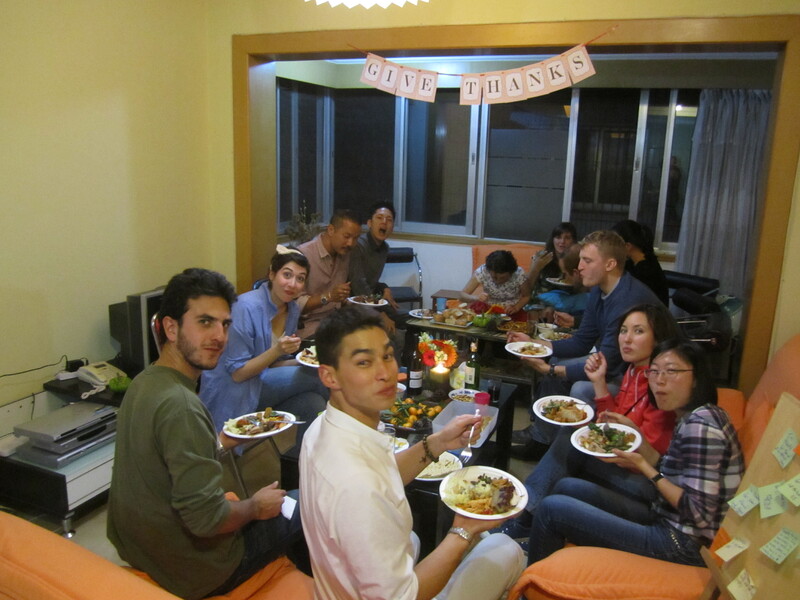 Some people were new to Thanksgiving, some people were missing their families in America, but we were all very thankful to celebrate together! 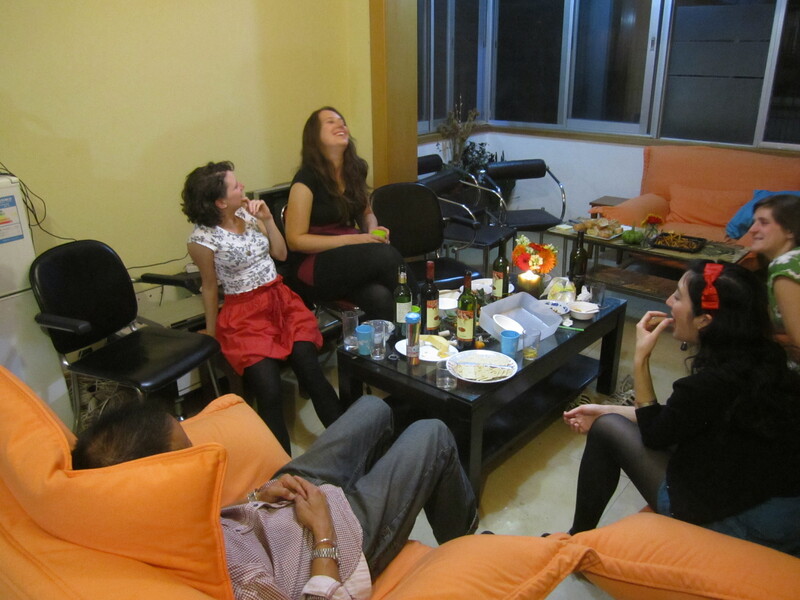 It was an international affair with people from China, Singapore, Italy, Ecuador, and the US. I can’t wait to host again next year, wherever I’ll be! What a wonderful entry to wake up to this morning! You have figured out how to put on a Thanksgiving dinner at such a young age…congratulations! Actually, your photos (and words) are a lot like ours from the last few days. 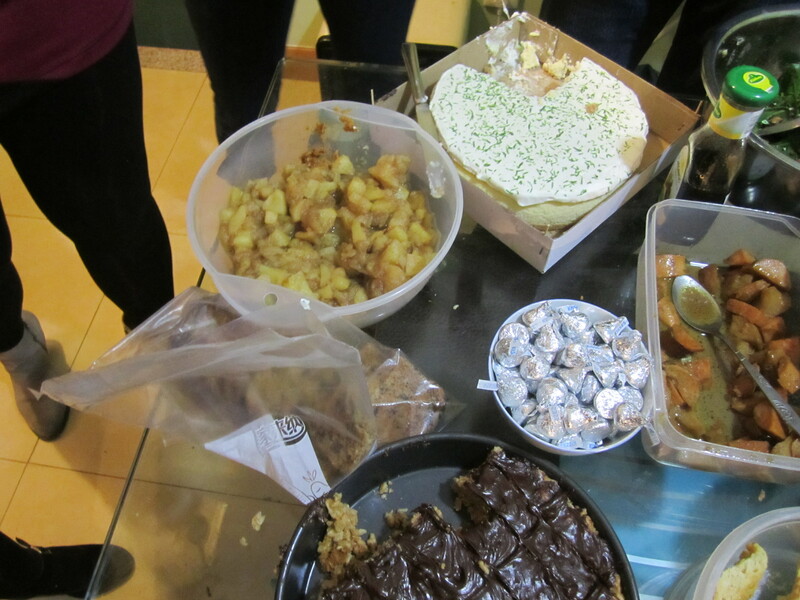 Many people crammed into a too small space, TONS of food, smiling faces with full plates and leftovers! I think we had 48 people this year. I’m very happy for your successful celebration. Love from Mendon! How very special you made your Thanksgiving! 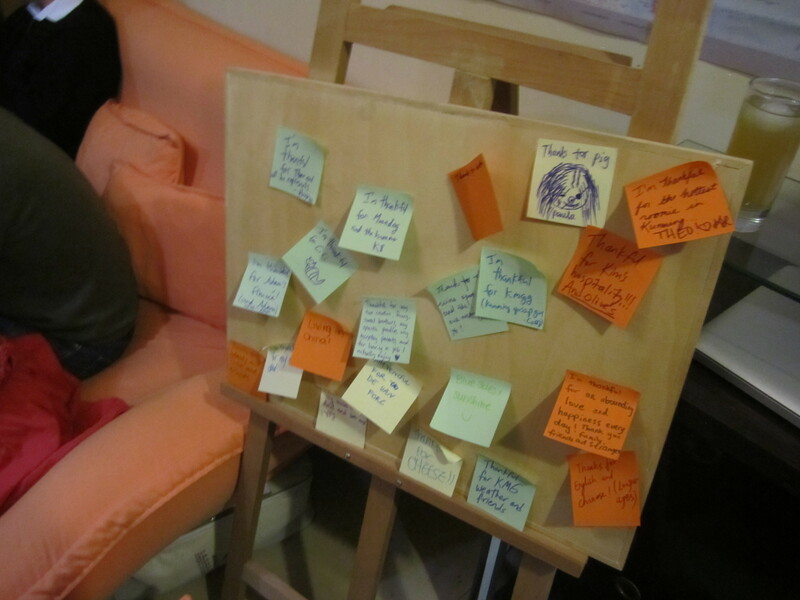 With all the traditional foods and friends plus your “clever easel thanks” you celebrated in style. You were with us in spirit for sure. We missed you in Mendon, but your description brought tears to my eyes thinking how you made such a special feast for those lucky enough to know you.